As I scooped malt-o-meal at breakfast I was writing a blog post about design problems with the Equinox Yoke Pullover. It’s been simmering for days and needs to be composed in a clear manner. But morning chores came first and when I took the no-longer-warm wood ash out to the lavender field I knew the sweater warning was going to be delayed. 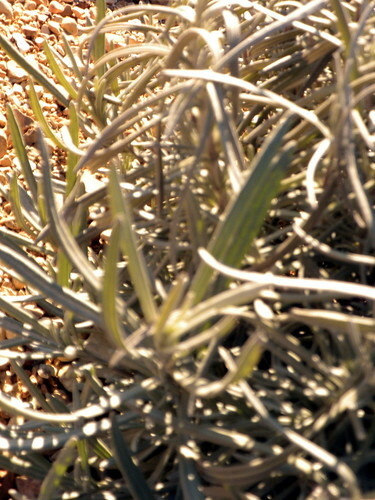 Wood ash is alkaline and lavender prefers a high level of alkalinity opposed to acidity so we let our wood ash cool – completely– and spread it (that’s using the term very loosely) in the lavender field. It’s organic – it’s sustainable. It solves the question of what to safely do with the wood ash from the stove. What I saw in the field plays directly into one of the reasons I love growing lavender. These plants want to grow and give it everything they’ve got to thrive. It’s been a cold winter here in NE Oklahoma. We’ve had a few days of warmth and sunshine lately but a strong winter storm is forecasted to hit us – again. 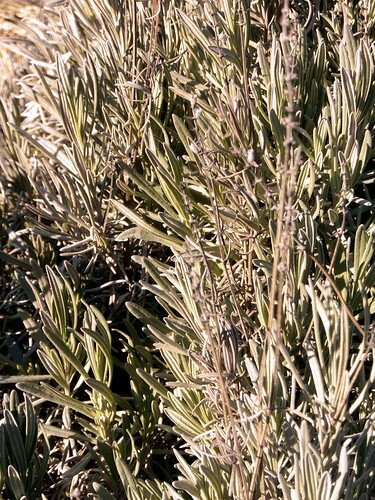 The lavender in the field – both the angustifolias and the intermedias have been basking in the sun and are greening up as if spring were just around the corner. Now they look straggly and woody for the most part just as they normally do during their dormant state. As I looked closer though I could see green within the gray and new little starts of leaves on the woody stalks. That photo is from plants out in the field, mature plants. But out in the pasture that serves as our front yard we’ve built six raised beds as part of a lavender experiment. They have primarily gravel from our creek, layered with a bit of top soil in the middle which as dusted with lime from the quarry. The plants have done quite well in these raised beds and we’re hopeful that they’ll be a nice addition that holds less drainage problems and uses less weeding time. 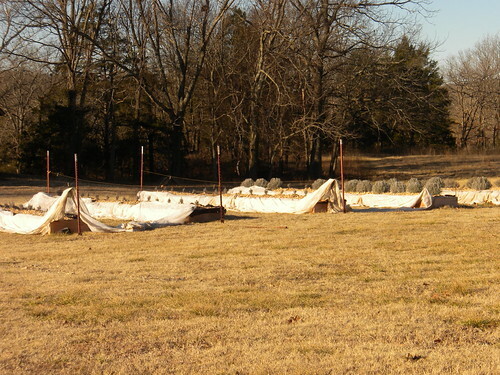 Because raised beds have less adjacent ground to help keep it warm we’ve experimented with row covers this winter. So far so good there too. We pulled the row covers ( a light fabric that allows sunlight and rain to reach the plants – yet helps protect them from low temps) off the plants in the past week to allow maximum sunlight. Again with these plants I’m seeing bits of green and small leaf shoots on the stalks. I’m nearly giddy but that joy is tempered with the knowledge of Oklahoma’s temperature fluctuations. Tomorrow the row covers will go back across the raised beds – and I’ll go back to blogging about knitting, yarn, cupcakes and maybe chickens. This entry was posted in clear creek country life, Equinox Yoke, Lavender by lostcityknits. Bookmark the permalink.